Before every Galliani Day™, or the last day of any mercato, I try to get into my doctor for a physical. I take special care to make sure my heart is functioning properly, my cholesterol level down, my asthma is in check, and any other things I can think of that might suffer from a sudden shock, good or bad, in the transfer market. And despite the fact that this mercato’s Galliani Day™ was really Tuesday, with the news of Balotelli’s signing, Milan fans may need plenty of Alka Seltzer or other acid-nullifying substance as we all hope for just a little something more, maybe in the midfield or defense. Not that we are ungrateful or greedy, just hopeful, that’s all. Ever since last summer’s exodus from hell, I am consistently criticized for being too negative. Personally, I think I’m just being realistic, it’s the actions of the club that are negative. And this transfer window is no different. I mean yesterday, we signed a world class striker for a little over half of his initial market value. 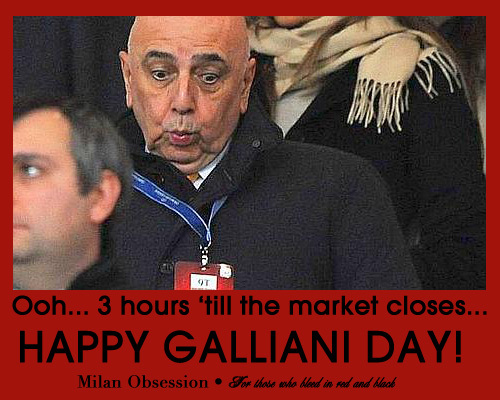 Two days beforeGalliani Day™. What the hell? How does Milan always get themselves into these situations? Now we have the most feared front line in Serie A, possibly in all of Europe. How could we let this happen? Why always Milan? Today’s installment of obscure song reference week is Front 242’s “Headhunter.” Not only did Milan lock the target, bait the line, and slowly spread the net, we also caught our man. A victory, clean sheet, and a little help from some other clubs and we caught 5th place on the table. Take that, Goddess of the Hunt. Continuing with obscure musical reference week around here, I hope The Vandals inspire our boys to a win with Lady Killer. Yes, let’s defeat the lady known as Atalanta. The Goddess gave us a very painful 1-0 defeat at home at the beginning of the season. Now it’s time for payback. And everyone knows that payback is… an Atalanta. In a game where Milan brutally dominated Bologna offensively, we were our own worst enemy, too. But there were some spectacular performances to go along with the self destructive moments, so all in all, it was a delicious game. Those three points put us in 6th on the table (with Inter and Roma still yet to play as of this writing,) and more confidence, too. In fact, for 90 minutes, everyone forgot all about the mercato nonsense, and let our current team show us what they’ve got. A brace from Pazzini? Waiter? I’ll have what he’s having. Last time we met Bologna was at the beginning of September. After having lost our first match, Pazzini secured a 3-1 win with a hat trick. Would it be too much to ask for a repeat performance? I am not actually that demanding, I would be thrilled with a win, regardless of who scores. With all of the teams ahead of us starting to slip up and show their weaknesses, we need to take advantage of every match and hope that our fortunes will increase and take advantage of our opponents’ misfortunes if we have any hope of achieving fourth place. Oh, wait, third place. Right. Anyway, perhaps Pazzini has another flavorful performance in him and can make a sauce out of this Bologna side. Over the past year, Milan has seen changes that are absolutely unprecedented during the nearly 27 years of Berlusconi’s ownership of the club. It has been called a “rebuilding” phase, but at this point, we are really pushing the use of that term. For example, when you want to rebuild a house, you don’t set fire to it and burn it to the ground. In fact, where I live, if you want to get a permit to call it a remodel, local laws require you to leave at least one wall standing. To apply this analogy to the team, we should not clear out all of the quality in less than a year. Some senatori need to stay to help with the rebuild. But will they? Does Milan management have an actual plan to rebuild? Or have they set fire to the house and are now letting it burn to the ground before they eventually rebuild? Filled with hope, with Allegri putting a dream three in attack and relegating Boateng to a supporting role in the midfield, for fans, it seemed like this match would be fantacalcio, the stuff dreams are made of. But instead, for 90 tense, frustrating minutes, we were slowly lulled to sleep by a Milan squad that was lethargic and uninspiring, a team that was evenly matched in this Sampdoria team. After a summer of dread, there was still hope in our hearts as we hosted our first opponent of the season. But that hope was ripped out of our hearts, stabbed, and stepped on by Sampdoria when they came to the San Siro in August. One goal was enough to crush the dreams of Milan fans everywhere. The dreams that maybe, just maybe, this summer’s downsizing from hell wouldn’t hurt as much as we all feared. One goal is all it took to humble us and bring us crashing to the reality of our new existence. But since then, we’ve proven this initial assessment wrong. We’ve shown the world that a club is greater than its missing parts. Well at least a few times, we have. So Sunday night, we travel to the Marassi with revenge on our minds, even if there’s still a little fear in our hearts. Watch out, Sampdoria, it’s payback time. The Coppa Italia was supposed to be Milan’s objective this season. And today, we were eliminated by Juve. Therefore, our season is over, right? If you think so, then you may not want to keep reading. First of all, it may have been our best chance of a trophy this season, but it also may be a blessing to not have to bother with one more competition. Secondly, we are only halfway through the league and we still have Champions League, too. But the most important thing about this game is that it showed us that when push comes to shove, and everything is on the line, our boys will fight. Well done, boys. I think our season might actually just be starting. The time has come for Milan to be tested. If we truly are after the coccarda patch, also known as the Precious, the one patch to rule them all, then tomorrow’s battle will be the turn of the tide, one way or the other. We are faced with the task of going into Mordor, not to destroy the ring, but to take it from the enemy. If we win, it could be the dawn of the Age of Milan. If we lose, then Sauron’s Army (Juventus) will seek to rule all of Serie A with a darkness and evil that puts fear into the hearts of men. I wasn’t sure what to expect with this match. The first match back after the break is always a little tricky to predict, and with all of the controversy this week, this one was even harder. Maybe it was just the early hour here, but this win didn’t make me as happy as usual. We were missing our center backs, and a lot of initiative, at least in the first half. Add in the penalty call, and conceding another goal on a header, and I kind of wish I had slept instead. There is one player who has divided Milan fans more than most in recent memory. At the age of only 23 years old, his career has transcended to the heights of scoring records and the depths of the injury list. So I suppose it is appropriate that fans’ loyalties would follow. Of course, I speak of the one and only Alexandre Pato. But this post is not for the haters. You know, the fans who blame him for being injured, or discuss his relationship with Barbara Berlusconi with base terminology and juvenile comments. Let’s just put it this way: if you are less mature than my children, please just stop reading here. This post is for people who have a reading level above the 3rd grade level, who have some form of aptitude in the art of logic, and can differentiate between opinion and fact. Haters Need Not Apply. Welcome to Milan Obsession’s new look! After almost two years, and all of the changes that Milan has made, I decided to have a Year Zero of my own. I hope you like it and I am working on adding more features throughout the year to make the blog even more informative and useful for all of you. As for Milan’s Year Zero, they have the opportunity to improve their fortunes in the mercato. But will they spend a fortune to make it happen? Not likely. The bigger question is will they stick to their new “plan” to invest in youth and keep wages low? And will they actually make the right decisions to improve the team now and into the future?